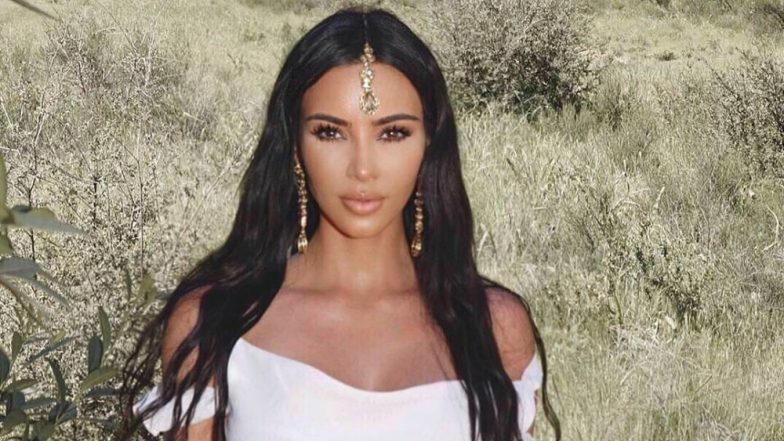 Los Angeles, April 10: Reality TV star Kim Kardashian West has courted criticism for wearing a traditional Indian maang tika, a jewellery piece worn on the head, for a church service. The 38-year-old mother-of-three shared her outfit on social media with the caption 'Sunday Service Vibe', but some Instagram users were unimpressed with her mishmash of cultural items, reported dailymail.co.uk. Kim Kardashian West Sports a Maangtika While Flashing Her Curves in a Two-Piece Co-Ords Like a Boss (View Pics). One user said that "culture is not a costume" and that it was wrong for Kim to adorn it. "This is not a Sunday Service Vibe, it's an Indian vibe," another complained. "For those of you who don't know, the maang tika is a ceremonial head piece traditionally worn by the bride. Wearing white in India is traditionally reserved for funerals," another explained. "On top of that she wore this to a Christian service. She probably thought it was just jewellery, but when that piece has literally been used for centuries wouldn't you kinda think there must be some sort of significant meaning held towards it," wrote another user. There was a different side to the coin as well, as not everyone found Kim's look offensive.